Extreame Savings Item! 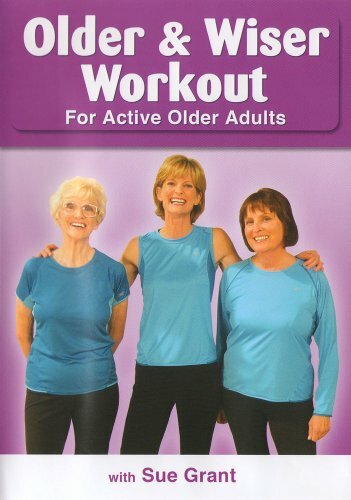 Save 41% on the Older & Wiser Workout for Seniors and Active Older Adults by Bayview at Epic Movie. MPN: unknown. Hurry! Limited time offer. Offer valid only while supplies last. The Older and Wiser Workout with Sue Grant is a gentle, safe workout that is perfect for beginners or those who have not been exercising regularly. The Older and Wiser Workout with Sue Grant is a gentle, safe workout that is perfect for beginners or those who have not been exercising regularly. All of the exercises are done either standing or sitting on a chair with no lying down on the floor. This fun, well rounded workout includes the three vital components of fitness: easy-to-follow low impact aerobics (23 minutes), gentle stretch training (21 minutes) and relaxing cool down & stretch (10 minutes). You may mix and match these different sections depending on how much time you have and how you are feeling each day. In addition, you will see three different levels for each exercise, so you will be able to ''customize'' this workout to meet your particular needs. You'll love the upbeat encouragement and helpful cues, and you will be amazed at how quickly you progress! Equipment needed: sturdy chair with no arms, 2-5 lb. hand weights for strength training, a small pillow (optional). Sue Grant, certified Master Instructor for FallProof, an internationally recognized Balance and Mobility training program is also certified by the American Council on Exercise and the Arthritis Foundation. Sue holds a Professional Certificate in Fitness Instruction and Exercise Science from UC San Diego, specializing in both Personal Training and Group Fitness Instruction. She is a certified Older Adult Fitness Specialist.